CANBERRA, Australia (AP) — A plan to project a horse racing advertisement on the famed sails of the Sydney Opera House is dividing Australians. The New South Wales state government stepped in to allow the advertisement to be displayed Tuesday after the opera house chief executive Louise Herron opposed it. State Premier Gladys Berejiklian said on Monday the advertising for The Everest horse race had been “toned down” since its original proposal. “It’s important for us to support our major events, it’s important for us to promote New South Wales but, of course, do it in good taste and I believe that tomorrow evening strikes that right balance,” Berejiklian told reporters. “This is a global event that receives global attention,” she added, referring to the Sydney horse race, which will be run on Sunday. More than 130,000 people signed an online petition by early Monday to stop the promotion. While some have defended the promotion as having economic benefits, others say it is crass commercialism and threatens the iconic building’s value as a World Heritage site. Anti-gambling campaigner Tim Costello said the advertising demonstrated the power of the Australian horse racing industry that made a profit of 3.3 billion Australian dollars ($2.3 billion) last year. “The gambling lobby, particularly in New South Wales, is the equivalent of the National Rifle Association in America. It … has politicians in the palm of its hand,” Costello, a spokesman for the Alliance for Gambling Reform, told Australian Broadcasting Corp.
“These events generate massive economic opportunities. I don’t know why people are getting so precious about it,” Morrison said. Graham Quint, a National Trust of Australia manager, said the advertising contravened federal and state laws governing use of the Opera House. “People have a great deal of respect for the Opera House, it’s World Heritage so people worldwide treasure it … and the idea that we’d use it as a Parramatta Road billboard is quite wrong — this is just crass commercialism,” Quint said. “The World Heritage listing requires not only that the building be preserved in its fabric, but also that it be presented properly … and no way under the current conservation management plan should this be allowed,” Quint added. Racing NSW chief executive Peter V’landys wrote in The Sydney Morning Herald newspaper on Monday that his organization had wanted to advertise the race on the Sydney Harbor Bridge. But the state government blocked that plan and offered the Opera House instead. 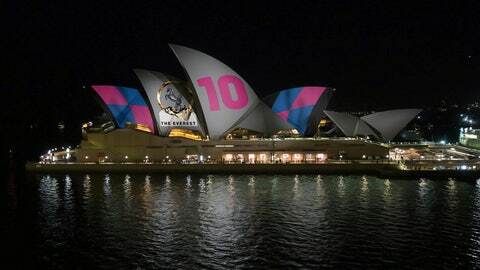 “Let’s be clear, Racing NSW never intended for the sails of the Opera House to be used as a billboard,” V’landys wrote.